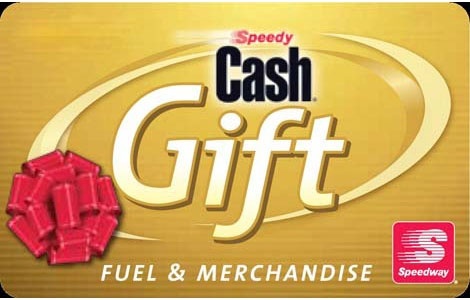 The Speedway Gift Card is the perfect way to add some fuel to your new or existing incentive program! The Speedway Gift Card gives recipients the power, ease and convenience of a credit card without the monthly bill and finance charges! With more than 2,750 stores, Speedway ranks as one of the largest chains of gasoline and convenience stores. Recipients can use their Speedway Gift Cards for fuel, groceries, maintenance items, or snacks at any Speedway or Rich Oil location throughout the U.S.
Card issued by Speedway Prepaid Card LLC. Card is redeemable for fuel or merchandise at participating Speedway or Rich Oil locations. Card not redeemable for lottery, money orders, additional PrePaid Fuel Cards or Gift Cards. Only one (1) PrePaid Gift Card may be used per transaction. Card is replenish able and will be honored only when activated via authorized means. Call 1-866-836-6841 or visit any participating location for redeemable balance. Card is not redeemable or refundable for cash and lost or stolen cards will not be replaced.